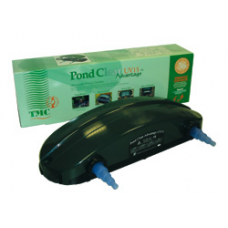 UV15 - Suitable for ponds up to 3000 UK Gal (13500 litres/ 3600 US Gal) with a maximum flow rate of 1500 UK Gal (6750 litres/1800 US Gal) per hour. • Robust construction and new ergonomic, green and black design. • Surface, filter or wall mountable and supplied with a wall mounting kit and a filter lid fixing kit. • Four-stage hosetails designed to take flexible hose from 1/2" to 1 1/4". Hosetails are held in place with screw on collars, allowing the disconnection of the hose, leaving the unit or the hose in situ for ease of servicing and maintenance. • Rigid pipe adaptors, for connection to 40mm solvent weld rigid pipe, are included with the unit. These adaptors are held in place with screw on collars, allowing the disconnection of the rigid pipe, leaving the unit or the rigid pipe in situ for ease of servicing and maintenance. • Easy access to working parts making maintenance quick and easy. • Supplied with a 5 metre power cable. • Complete with comprehensive instructions and backed up with full technical support from TMC. • Full 36 month guarantee against any defect or failure. This covers all parts and labour.